Like most of his business trips, the only sights he’d be taking in were those of Duty Free, Wok n’ Roll, Dunkin’ Donuts, and all the other apostrophic, postapocalyptic airport landmarks he vagabonded past countless times a year. People often made envious remarks about his business travel, not realizing that the homogeneous scenery endemic to virtually every airport in the United States made on susceptible to what Kennedy half-jokingly called “Terminal Illness”–a chronic frequent traveler disease brought on by extreme isolation, fatigue-induced delirium, fast-food malnutrition, excessive consumption of bottom-shelf booze, and diminished social equilibrium. He likened it to extended space travel, but with inferior cuisine. Unlike, say, Ryan Bingham, Kenney has a noble reason for spending so much time in airports. He flies all over the world — particularly the U.S. — training airport security officers (namely, the TSA). Sure, the TSA has their own training program, but airports will bring him in as a consultant to help beef things up. Thanks to a tragic loss years ago, Kennedy is one of the most invested security experts in the world — he’s more committed to airplane safety than most governments. To say he’s driven is quite the understatement. At the moment, there’s a security bulletin going around with a warning of an immanent terrorist threat. A few people in the CIA, FBI, NSA, TSA are taking it seriously, but most figure it’s just another in a long line of boys who cried, “wolf.” Kennedy, of course, takes it more seriously than anyone, and is pretty frustrated that he’s so alone in this. So when he’s approached by representatives of the intelligence community and given the opportunity to do something to stop this threat — not just consult, but act — he jumps in with both feet. And immediately finds himself in way above his head. Kennedy and the team he joins are racing against the clock — not sure when someone might strike, and really only pretty sure that they will. But if the threats reported are anything close to reality, if this attack goes off, it’ll be worse than anything in history. Kuhn’s an experienced thriller writer and he knows how to keep things tense and the plot moving. From the outset we know that the attack will take place 64 days from the time we first meet Kennedy. Each time you get to a new chapter and read, “Day X,” you feel the tension ratcheting up (like Lee Child’s 61 Hours in reverse). Kuhn keeps you turning pages as quickly as you can while ignoring the clock and the alarm that’s sure to go off in a couple of hours. Because of the kind of book it is you that know that certain characters are going to turn out to be something they don’t seem to be, or that events aren’t going to be what they seem to be. But Kuhn pulls most of them off so that it’s unexpected — for example, a plot development that I spent 100 pages for took my by surprise when it actually happened. There is some violence here, but for the genre, it’s pretty tame — it’s not sanitized, it’s not toned-down — it’s just utilized when needed, nothing to excess. Most of the characters were pretty much what you expect in a book like this — but that’s fine, those are why we read books like this. I don’t need every character to break the mold, I like certain types to be good examples of those types, and Kuhn has many of those running throughout these pages. If Nuri isn’t one of the best/most entertaining examples of she-nerd that you’ve come across lately, I’ll eat my hat. There are a couple of characters that aren’t from the typical thriller cast lists (see the musician, Love) are even better. I don’t want to compare this too often to Kuhn’s John Lago books, but I have to a little. Those books are marked for their voice, their satire, their off-kilter protagonists. This protagonist is exactly what you expect he is, and is pretty typical for the genre, and the voice is pretty straight. But every now and then you get a little of Kuhn’s voice (always appropriate to character and the work, don’t get me wrong). Like when Kennedy and his team are trying to guess when and where the terrorists will attack, and we get the line, “Terrorists are basically psychotic public relations whores.” Followed by “The choice of 9/11 was basically branding, a tongue-in-cheek play on our emergency number, which makes the date more memorable.” A little snarky and astute, the kind of talk you get around a conference table while brainstorming. The analysis of holidays during this exchange made me laugh. Basically, he knocked it out of the park. Even some of the twists I guess that we’re shocked when they were revealed nail-biting right up to the end. 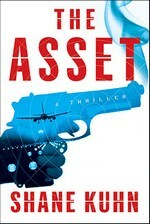 The Asset is a heck of a stand-alone thriller. If the publisher decides for more adventures of Kennedy, I’m in. I think I like Kuhn’s series better than this kind of thing, but man, this one hit the sweet spot. I hope it brings him a lot of success. I received this book from a drawing on the author’s website. Mega-Thanks to Shane Kuhn and Simon & Schuster for the good read. As it was an ARC, there’s a chance that the quotations above might not be in the published version, I’ll try to confirm as soon as I can in a couple of weeks.